This cake reminds me of the kind of thing my Italian nonna would make, if I had an Italian nonna. No wonder my husband, who is half Italian, scarfed this up! Caitlin of Engineer Baker chose this, Dorie’s Fluted Polenta and Ricotta Cake, as our TWD recipe of the week. Polenta in this case is just another name for yellow cornmeal, so the cake had sort of a sweet cornbread feel to it, but combined with ricotta and honey, it was quite moist. And you can’t tell from the outside, but hidden in the cake are…dried figs! Normally, I am not a fan of dried figs (a lasting side effect of my childhood aversion to Newtons), but they work really well here. Their little seeds give a pleasant crunch to the cake. I did use a couple less than the recipe called for, though, and I chopped them into quarters so I could more evenly scatter them throughout the batter. I wanted to follow Dorie’s suggestion to put a few thyme leaves into the batter, but then of course I forgot! So I made thyme whipped cream instead, by rubbing thyme leaves into the sugar that sweetened it. Please, no judgements about the massive amount of cream in that photo–I know I went a little overboard! This was a lovely cake…simple and homey and good for breakfast (maybe without the mountain of whipped cream). I made a half batch, which fit perfectly into my 7 1/2-inch tart pan. Early reports from some other TWDers were that the cake was a bit too sweet. I went a little skimpy on the measurements for both the sugar and honey, and it came out just right. The only thing that left me scratching my head was the extra little hunk of butter that gets dotted on top of the cake before it goes into the oven. It didn’t seen to do much but make some pale colored spots on top…I think I’ll leave it out if I make the cake again. You can find this recipe in Baking: From My Home to Yours by Dorie Greenspan, and on Caitlin’s site. Now go check out the TWD Blogroll! Lovely. You did a great job on this. I really enjoyed it this week! Oh my. I was already sad that I had to opt out this week, now I’m completely heartbroken. That…looks…delicious. Your cake and photos are superb. yum! Yours look so good! My cake ended up falling apart (b/c I dropped it) so I’m jealous of your pretty pictures! Well you have been busy! 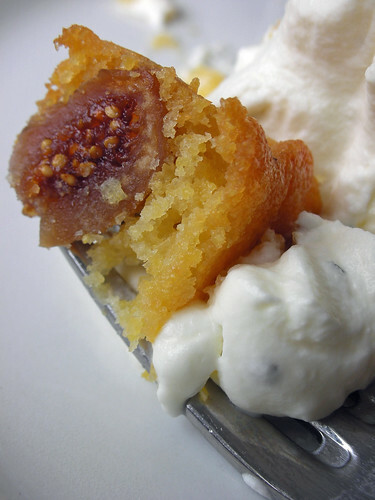 I adore figs, so must try this. And I am going to have the whipped cream for breakfast too……. Love the cake with the cream. What a yummy idea! Great job! Beautiful! I completely overlooked Dorie’s thyme suggestion. Now I want to make it again so I can try that. Lovely presentation! I, too, enjoyed the cake. In fact, I kept some for myself this time instead of giving it away like regular. Hey, no judgment here on that whipped cream. Great job! This was a lovely cake. Your pictures are beautiful. I have to say, I’m with you on the butter dotted on top. It really didn’t seem to do much. i love you photos and the writing on them, it always makes everything look so polished and delicious- maybe that is why I always nominate your blog because it is one of my faves! I love the huge amount of cream in that photo! 🙂 Your cake looks beautifully delicious, and thyme whipped cream is so very creative! I thought about adding Thyme, but I wasn’t sure what it would taste like, I would like to taste the thyme whipped cream… Sounds delicious. That looks so mouthwatering, Steph. Gorgeous photos! Your pictures are perfect! I love the way yours looks! Well done!! Your cake looks beautiful. And, I took my picture with a little whipped cream, then added more. I am a huge fan! 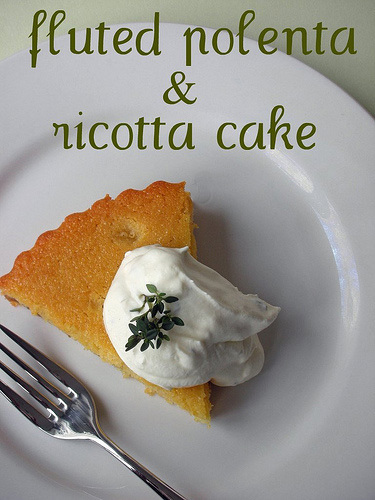 Your cake looks fabulous and I love the idea of scenting the whipped cream with aromatic herbs! I wanted to use thyme as well, but thought it would go best with dried apricots, so that’s on my “to bake” list for next time. Your breakfast comment makes me think this might be good toasted. Maybe I will have to try making it again. Your photos are great – and I didn’t even see Dorie’s thyme suggestion, so I’ll have to try that next time. Looks awesome, I love your photos! I thought the butter bits on top were a weird addition too, next time they won’t make the cut. oooo this looks fantastic!!! The kind of thing that I’d love and figs aswell are even better!!!! Your cake looks lovely! Love the whipped cream on top! Great job! Lovely work and a beautiful blog. I always enjoy checking out your creations. love your photos, the cake looks beautiful! thyme whipped cream sounds like a perfect extra dollop! Thyme-scented cream sounds lovely! Great pictures! Ricotta and polenta …can only be a winner combination. Lovely photos, but then I have never seen a bad one on your posts. Love the cheesecake pops too. Your cake looks wonderful with it’s mound of whipped cream! I would have never thought of making thyme-infused whipped cream; what creativity! I’m glad you tried out the cake and enjoyed it. I’m not sure what the butter on top was for either; it seemed odd to add butter chunks (more calories) for pale little circles. I love that second picture – it looks so moist and tasty!